Two weeks ago, Davidi Kitai won his second bracelet when he took down the $5,000 Pot Limit Hold’em event, setting a Belgian record for number of World Series of Poker bracelets won. 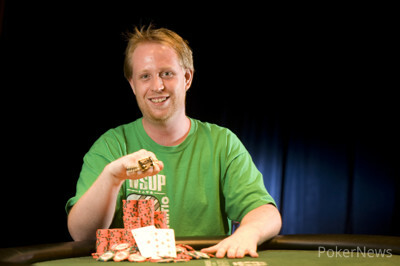 Today, Kitai is joined in the Belgian multiple bracelet winner’s club by Michael “Timmy” Gathy. In 2012, Gathy won the $1,000 No Limit Hold’em event and today he added a second bracelet to his collection by taking down the $1,000 No Limit Hold’em Turbo event. Day 2 of this action-packed event started with 35 players from the original field of 1,629; each of the players was guaranteed at least $6,729 for the effort as the money bubble burst on Day 1. During the course of the day’s play, the tournament lost the likes of Jamie Rosen (33rd), Ognjen Sekularec (32nd), Simon Charette (18th), Sam Greenwood (17th), Jennifer Tilly (13th) and Tom Alner (12th). The final table was reached at around 18:15 and within one hand, it had lost its first player. Russell Crane ran his into Jake Cody’s and didn’t improve so became the ninth place finisher. Another 29 hands passed before Noah Vaillancourt open-shoved from UTG+1 with what turned out to be and was looked up by Yueqi Zhu and his pair of red nines. The board ran out to send Vaillancourt to the cashier’s desk to pick up eighth place money. Next to go was Jake Cody. The popular British pro had the infamous British railbirds cheering and jeering him on right until the final river landed on the Rio felt. Cody had earlier lost a flop with ace-king versus pocket tens and he would suffer a similar fate in his final hand. Jason Duval opened to 50,000, Cody moved all in for 417,000, Gathy re-shoved and Duval folded. Cody showed and was against a pair of black tens. The tens stayed best and Cody and his army of fans left the Amazon Room. Sixth place went to Duval who busted in unfortunate circumstances. The action folded to Duval in the small blind and he attempted to steal the ample blinds and antes with an all-in raise. Unfortunately, for Duval at least, Benjamin Reason woke up in the big blind with a pair of queens, which held, to send the recent bracelet winner to the sidelines. Five became four when Daniel Bishop committed his stack with on a flop and was looked up by Zhu and his . Zhu missed his flush draw but spiked a king on the turn to send Bishop home for an early bath. Bishop’s exit took place on the 100th hand of the final table and it wasn’t until the 140th hand that we saw another elimination take place. Sergey Rybachenko had earlier lost all but 15,000 chips (one small blind at the time) and had mounted an epic comeback that saw him double up in four times! However, any hopes of him becoming the Russian Jack Straus were ended when his couldn’t improve to come from behind to beat the of Gathy. Two hands later and Zhu was sent to the rail, again by Gathy. On a flop that read , Gathy led for 90,000. Zhu moved all-in with his and Gathy called with . 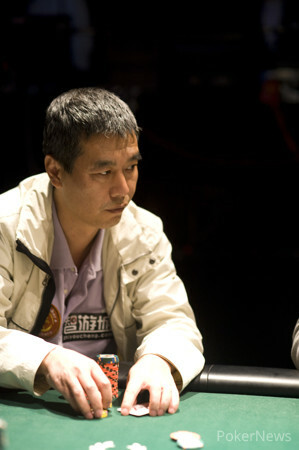 Zhu received no help from the turn or river and the tournament moved to the heads-up stages. Going into the one-on-one battle, Gathy held an almost 4-to-1 chip lead and it proved too much of a gap for Reason to bridge. On the 24th hand of heads-up play and the 166th of the final table, Reason opened to 80,000, Gathy three-bet to 180,000 and Reason moved in for 905,000. Gathy called and showed and he was ahead of the of Reason. Gathy caught a nine on the flop, and improved to trips on the turn. Gathy improved further still wen the river gifted him an unnecessary full house, busting Reason and leaving Gathy to be announced as the latest WSOP champion. That concludes our coverage of Event #34. Keep your browsers locked to PokerNews.com for the rest of the World Series of Poker as we bring you all of the action, as it happens, from the 2013 WSOP. Benjamin Reason opted to fold from the button, relinquishing the pot to Michael Gathy. Michael Gathy then opened to 80,000 from the button, and won the pot after a quick fold. In the final hand of the night, Benjamin Reason opened to 80,000 from the button, before facing a raise to 180,000 from Michael Gathy. He looked down at his stack, before announcing all in for 905,000. Gathy took a minute to decide, carefully contemplating his decision, before making the call. Gathy extended his lead on the flop of , and sealed the title, when the fell on the turn. The meaningless completed the board, as Reason shook his opponent’s hand, finishing so close to a maiden bracelet. 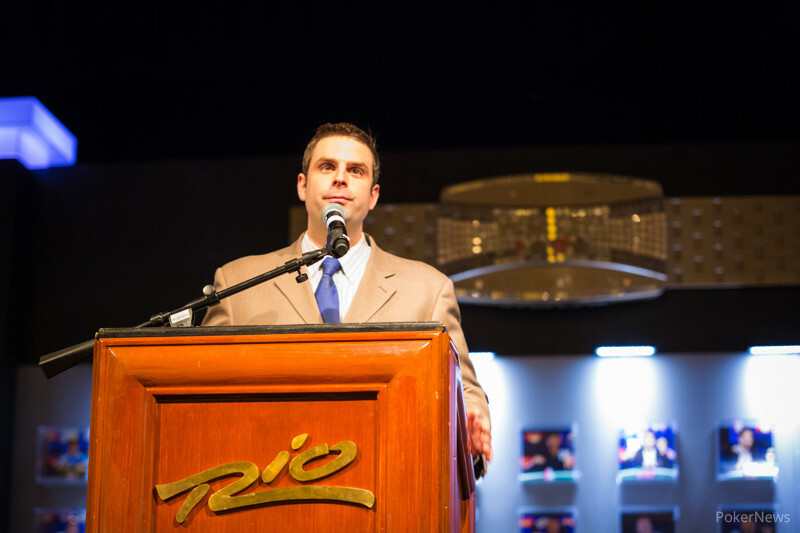 Hand 151: Michael Gathy opened to 80,000 and Benjamin Reason folded. Hand 152: Reason raised to 80,000 and Gathy folded. Hand 153: Gathy opened to 80,000, Reason moved all in and Gathy folded. Hand 154: Reason made it 80,000 and Reason called. Gathy then check-folded to a 60,000 bet on the flop. Hand 155: Gathy raised to 80,000 and won the pot uncontested. Hand 156: Reason folded his button. Hand 157: Gathy folded his button. Hand 158: Reason folded his button. Hand 159: Gathy opened to 80,000 and Reason called. The flop saw Reason check, Gathy fire an 80,000 and Reason call. The turn saw Reason lead for 105,000 and Reason fold. Hand 160: Reason folded his button. Hand 161: Gathy made it 80,000 to play and Reason folded. Hand 162: Reason set the price to play at 80,000, Gathy three-bet to 180,000 and Reason folded. Hand 163: Gathy opened to 80,000, Reason shoved and Gathy snap-folded. First hand of Heads-Up play goes to Michael Gathy, after Benjamin Reason folded on the button. The favour was returned the next hand, as Benjamin got his chips back. Benjamin Reason opened to 80,000, which was enough to win the pot. Michael Gathy gave it a shot next hand, opening to 80,000, before taking down the pot. 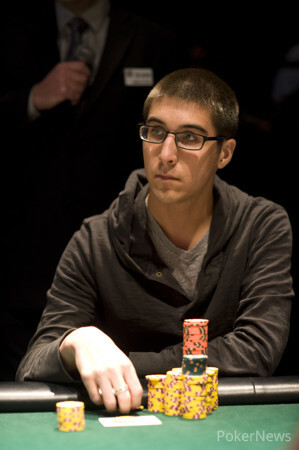 Benjamin Reason would win the next hand with a repeat bet of 80,000 from the button. Chips would be returned the very next hand, after Michael Gathy opened for a min-bet from the button. Benjamin Reason opened to 80,000, and we saw our first flop of after Michael Gathy made the call. Both players were happy to check, before the came on the turn. A bet of 95,000 from Gathy was called, before the completed the board. Check-check would follow, before Reason showed his for a pair. Gathy then showed his for a higher pair, as he took down the first significant pot between the two. Hand 141: Michael Gathy received a walk in the big blind. Hand 142: Gathy opened to 85,000 in the small blind and Zhu called. The flop saw Gathy continue with a 90,000, Zhu shoved and Gathy called. Gathy's pair of kings stayed best as the and completed the board, Zhu eliminated in third place. Hand 143: Gathy opened and Reason folded. Gathy holds a 3,900,000 to 1,000,000 chip lead going into heads up. 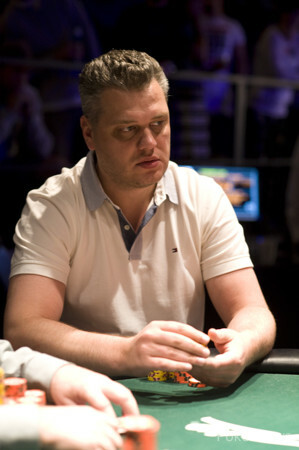 Sergey Rybachenko opened for 80,000 from under the gun, before Michael Gathy raised to 175,000. Rybachenko didn’t slow down, moving all in for just under 700,000 in chips. Gathy snap called, as both players tabled their cards. The board ran out , to finally see Rybachenko hit the rail, after a making a remarkable comeback from near elimination. Benjamin Reason kicked things off with an open to 80,000 from the button, which brought a fold from both blinds. Michael Gathy opened to 100,000 from the small blind, before Yueqi Zhu moved all in. Gathy’s cards went into the muck, almost as soon as the raise was announced. Hand 135: Benjamin Reason opened to 60,000 from under the gun, Michael Gathy made it 150,000 from the small blind and Reason called. Gathy then led on the flop with a 115,000 continuation bet and Reason folded. Hand 136: Reason received a walk in the big blind. Hand 137: Reason opened to 90,000 from the small blind and met no resistance.